Jade King Carroll is home again. The director of “Detroit ’67” likes to direct plays about “family and home,” she says, describing the Dominique Morisseau drama next up at Hartford Stage as being about “people taking care of each other" during turbulent times. Hartford Stage is sort of a second home for Carroll. This is the third show she’s done at the theater in the past three seasons. The others, which both played Hartford in 2016, were “Having Our Say: The Delany Sisters’ First 100 Years," a co-production with New Haven’s Long Wharf Theatre; and August Wilson’s “The Piano Lesson,” a co-production with the McCarter Theatre in Princeton, N.J.
“Detroit ’67″ is yet another co-production – it was at the McCarter this past fall, and arrives in Hartford with the same cast and creative team. The drama, which opens Feb. 14 and runs through March 10, takes place in a basement of an after-hours club run by a widowed mother named ‘Chelle and her younger brother Lank during the hot summer of what is often called “the Detroit Riot” or “the Detroit Rebellion.” That intense five-day period of protests, confrontations and violence resulted in dozens of deaths, thousands of arrests and hundreds of burning buildings. It began with altercations following a police raid on an after-hours club. In Morisseau’s play, ‘Chelle and Lank and the friends, plus a mysterious visitor, hunker down in the basement while violence erupts outside. “The biggest difference” in the show after moving from the McCarter to Hartford Stage, Carroll says, is “going from a proscenium to a thrust stage. The scenic designer and I are talking all the time." Carroll is certainly at home with Morisseau’s works. She originally knew the playwright as an actor, directing her in a New York production of Zakiyyah Alexander’s “The Etymology of Bird” in 2010. Carroll has worked on productions of every one of Morisseau’s plays. After doing “Detroit ’67,” she’s off to direct “Skeleton Crew” in Maine. Besides keeping in touch with the playwright, Carroll does considerable homework to make sure she gets right the tone of the plays. Connecticut’s first taste of a Morisseau drama was when TheaterWorks did the incendiary three-character father/daughter drama “Sunset, Baby” in early 2017. That production was directed by Reginald L. Douglas, the artistic producer of City Theatre Company in Pittsburgh, where Carroll directed “Sunset, Baby” in 2015. “Detroit ’67” is part of Morisseau’s “Detroit Project” trilogy, which examines African-American life in Detroit at key points in the 20th century. “Paradise Blue,” which was directed by Awoye Timpo at New Haven’s Long Wharf Theatre in November/December, is set at a jazz club in the city’s Paradise Valley region in the 1940s. “Skeleton Crew,” which will be staged at Westport Country Playhouse in June (the director has not yet been announced) is set at a soon-to-close auto stamping plant “somewhere around year 2008,” according to the script. “These plays all stand on their own,” Carroll says — you don’t have to know all three of the plays to appreciate any one of them. “Detroit is what unifies them. The playwright is what unifies them. Love and family is at the heart of all of them. It’s the same as with the plays of August Wilson” – another playwright the majority of whose works Carroll has worked on, whether as a director or assistant director. Wherever she works, Carroll makes clear, “it’s important to learn what the audience is like in that city. When I’m in Hartford, I need to speak to the Hartford community." With Morisseau’s plays, “you want the audience to feel at home.” Even in a shabby basement. 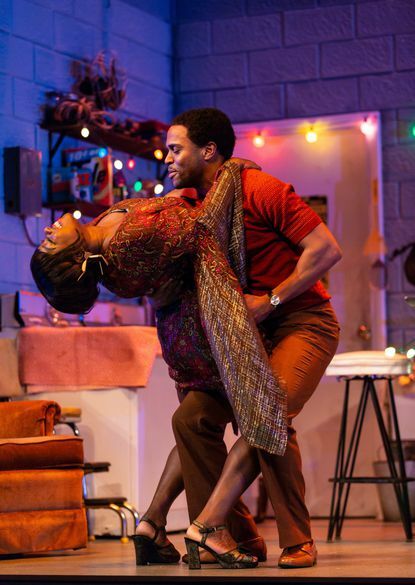 DETROIT 67, a co-production with the McCarter Theatre in New Jersey, runs Feb. 14 through March 10 at Hartford Stage, 50 Church St., Hartford. Performances are Tuesday through Thursday at 7:30 p.m.; Friday and Saturday at 8 p.m.; and Sunday at 2 p.m.; with added shows Feb. 23, March 6 and 9 at 2 p.m. and Feb. 17 and March 3 at 7:30 p.m. Tickets are $25 to $90. 860-527-5151, hartfordstage.org.